This post has kind of come out of nowhere. I wasn't planning to write it. I haven't been to the U.S. for two years but I will be going for summer vacation on July 25th and I'll be there for two weeks (yes, short but that's what I get for summer vacation) through Aug 10th. I will be visiting family in Boston, Chicago, San Diego and Los Angeles. While in Chicago, I'll visit my favorite LCS (Local Card Shop) and pick up supplies to put in my suitcase. They do not sell packs of penny sleeves or cardboard boxes here in Korea and all other supplies (i.e. 9-card pages) cost twice as much. When in San Diego, I will try to get out a PSA submission I've been planning for some time now. That's what this post is about. For those of you who do not know, I am a huge Lee Seung-yuop collector. 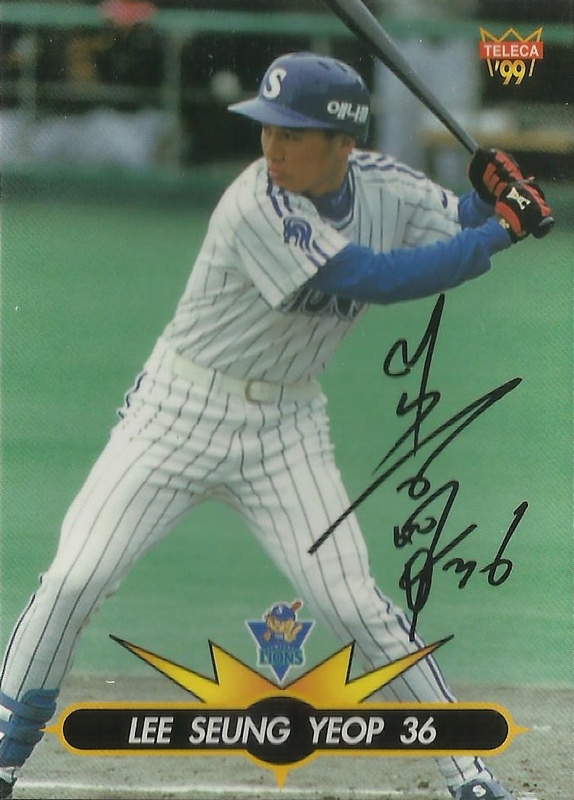 He played for the Samsung Lions in the KBO from 1995-2003, and in 2004 went to the NPB for eight years to play for the Chiba-Lotte Marines (2yrs), Yomiuri Giants (5yrs) and Orix Buffaloes (1yr), before returning to the Samsung Lions in 2012 and retiring after the 2017 season. He is a 7-time champion - Chiba-Lotte (2005), Yomiuri Giants (2009) and Samsung (2002, 2011, 2012, 2013, 2014). I moved from Chicago to Daegu, Korea in early 2014 and was spoiled with a Samsung championship that year. They lost in the Korean Series the next year to Doosan. If you look back in my 2016 posts, you will find a PSA submission post I did on some Lee cards. I'll post a few below. I had a great grader for that submission and all but one of the Lee cards came back GEM MT 10. I have been collecting Lee cards pretty much since I arrived in 2014. 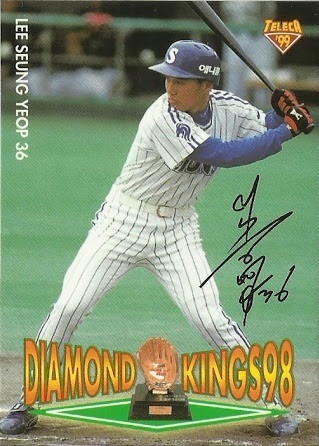 I didn't know much about him or KBO baseball before arriving, but I quickly became a huge fan. 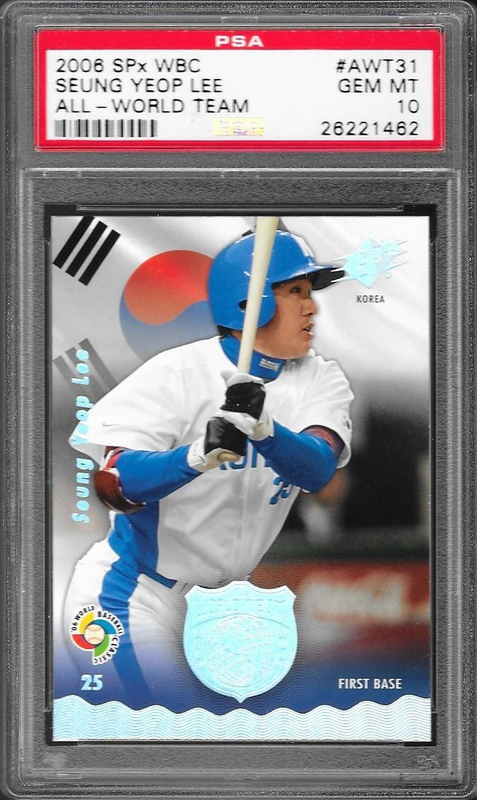 I've taken it upon myself to scan, crop and upload all Korean cards I pick up and it's been fun. The cards I have of Lee I have acquired through box purchases on Gmarket and single cards on Naver cafes (forums). His rookie year was 1995 but I am unaware of all the sets that have been released before my arrival in 2014 but have done a lot of research. One of my colleagues has been in Korea for a long time and he is known for his card collecting prowess and he has been writing a book about card collecting in Korea. 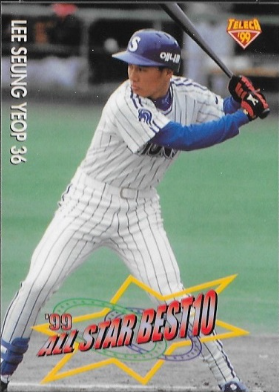 The earliest set I can think of that would have a Lee card is actually the 1998 Pro Stickers set. I think there is also a 1996 sticker set but I have none of those but assume he is in it. I don't have the 1998 sticker either. The 1999 Teleca set, I believe, is his first real rookie CARD. There were also subsets made in 1999 that have other RCs. 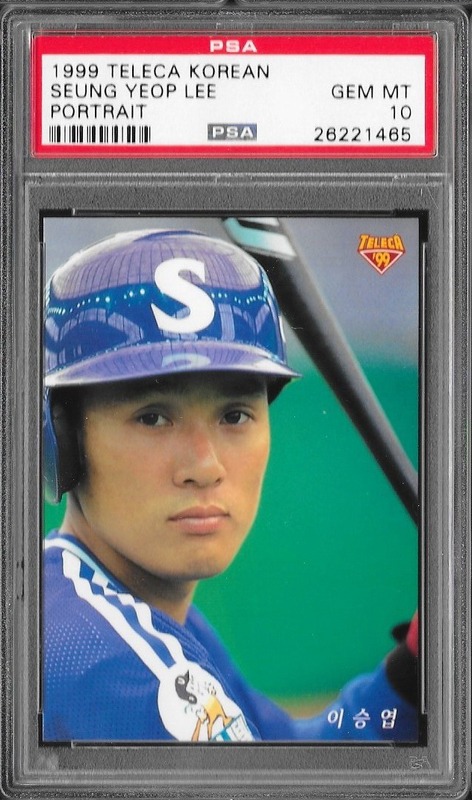 I do not have the base rookie card, but I do have the 1999 Teleca Diamond Kings #DK-8, 1999 Teleca Kolon Activ #A-11, 1999 Teleca Premium #52, 1999 Teleca All Star 10 Best #S-13 and 1999 Teleca Premium Super Teleca #1. The Teleca Premium and Teleca Premium Super use the same photo and foil appearance. Four of these (below) will be in my sub, the Super Teleca is over-sized. These five cards are the only pre-Japan cards I have of Lee. 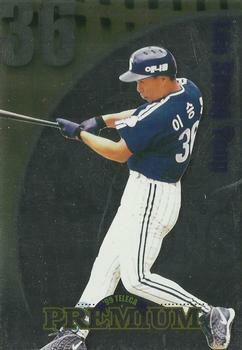 I do not know of all the sets released between 1995 (Lee's rookie year) and 2003, before his departure for Japan. Lee does have two card sets that I have seen online but have never purchased, they go for an extreme premium. 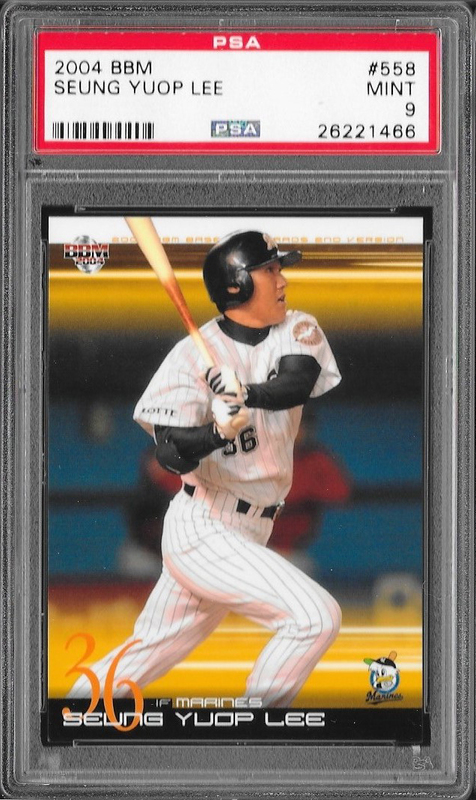 One is the 1999 Teleca Premium Home Run King set of 14 cards (I call it the Sniper set because that seems to be the name of them) and a 1999 Teleca Seung Yeop Lee Homerun 55 card set that came in a binder and is numbered. These are the four non-base RCs I will sub. Part 2 will introduce his Japanese cards. Thanks for reading this far. I have 1997 cards for Lee (regular and translucent).